Event scheduled for April 29 in downtown Los Angeles now includes a 5K and 10K. Take big steps to De"FEET" cancer at the Kids 4 Kids RUN/WALK. The Kids 4 Kids RUN/WALK and “All Star” Carnival benefiting Children’s Cancer Research Fund (CCRF) returns to L.A. LIVE on Sunday, April 29, 2012 – this year with a 10K course in addition to the 5K race. Presenting Sponsor and Team Owner TOYOTA and Team Manager Sidley Austin LLP will lead families and friends in the quest to De“FEET” pediatric cancer. CCRF launches the "SNORE 4 KIDS" Team, so even if supporters can’t be at the RUN/WALK, they can still participate! “After a very successful four-year run in Century City, then two stellar years downtown, we are delighted to be invited to return to L.A. LIVE for a third year,” said Matti Contopulos, Founder and President of the Children’s Cancer Research Fund. L.A. LIVE is the leading entertainment destination in Los Angeles; a one-of-a-kind entertainment campus which plays host to the GRAMMYs, EMMYs, American Music Awards, ESPYs, the Los Angeles Film Festival and hundreds of other star-studded events. The Kids 4 Kids 5K & 10K RUN/WALK empowers participants of all ages to take immediate action to help children with cancer while bringing together friends and family for a fun day of activity and entertainment. Scheduled for Sunday, April 29, the “All Star” Carnival will include Finish Line Entertainment, rides and game booths staffed by up-and-coming Hollywood talent. The event will take place at L.A. LIVE (across from STAPLES Center) at Chick Hearn Court (11th and Figueroa) in downtown Los Angeles. Event registration begins at 7:00 a.m. while the Radio Disney AM 1110 “Warm-Up” takes place from 7:30 a.m. to 8:30 a.m. The race starts at 8:30 a.m. and AMP Radio 97.1 will be providing entertainment along the course. The “All Star” Carnival opens at 9:00 a.m. and the “Yum 4 My Tum” Food Court – serving pancakes to burgers! – opens at 7:00 a.m. There will be free parking before 11:00 a.m. in the West Garage/Lot W at 1005 West Chick Hearn Court. 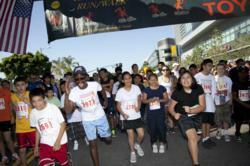 Participants of all ages are encouraged to register in advance at http://www.ccrf-kids.org. Advance registration fees are $10 (5K & 10K – under 18), $25 (5K – 18 and over) and $35 (10K – 18 and over). Registration for the SNORE 4 KIDS Team is $25. On-site registration will be available on race day for an additional $10. To learn more about Children’s Cancer Research Fund, visit http://www.ccrf-kids.org. Become a Facebook fan at: http://www.facebook.com/CCRFKIDS. Follow us on Twitter: @ccrf_kids, event hashtag: #K4K5K. About Children’s Cancer Research Fund: Established in 1987 by Matti Contopulos, CCRF is dedicated to providing national support for clinical research in pediatric cancer while improving the medical environment for all children. A Healthier and Happier tomorrow is the mission and promise of Children's Cancer Research Fund to children and their parents everywhere. Monies raised from the event will fund research in pediatric oncology as well as supplies for an art program at Paul Newman’s Hole in the Wall Camps. For more information, visit http://www.ccrf-kids.org.